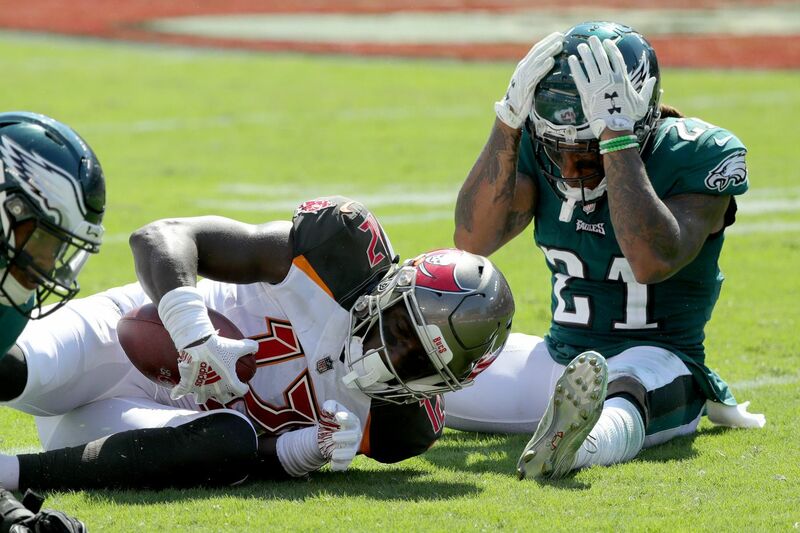 Ronald Darby (right) reacts after the Bucs' Chris Godwin catches a pass for a first down in front of him on Sunday. The Eagles are 1-1 on the season after losing to the Bucs at a sweltering Raymond James Stadium on Sunday, 27-21. We've got takes as hot as the weather. Take a look at what people had to say about the game on social media. Although it was a road game, it was a comfortable atmosphere for Birds fans, with lots of people making the trip south. When we say it was hot, we really mean it. As you're likely well aware, there are new rules regarding the national anthem at NFL games. Our reporters have been watching the sidelines closely. Michael Bennett wasn't on the field during the national anthem before #Eagles-Bucs game. Walking out now. The Eagles were facing former teammate DeSean Jackson, who was released by Chip Kelly and the Eagles after the 2013 season. Still amazing to think the Eagles released DeSean Jackson at 27 after the best season of his career. It was probably a lovely reunion. And then, less than 20 seconds into the game, the Eagles were quickly reminded of what they no longer had. The Eagles' misfortune was probably not making very many people happy at sports bars around Philly. But there were some people who enjoyed it. The loudest moment at FedEx today was the big screen showing the Eagles losing to the Bucs. We saw a bit of Fitzmagic on the field on Sunday. As you may recall, Ryan Fitzpatrick is starting for Tampa Bay for the first three games. Their original starter, Jameis Winston, might be getting a bit nervous. How silly must Jameis Winston feel right about now. Ryan Fitzpatrick is looking like a Hall of Famer while Winston serves a suspension because two years ago he decided to sexually objectify and assault an uber driver. Fitzpatrick lit up the Eagles defense, so we know you might not like the guy. But you can't help but be a little bit amused by the journeyman QB playing for his seventh NFL team. No, but seriously, what is with this guy? OK the Ryan Fitzpatrick thing is officially fascinating to me. I wonder if there's some secret deal where he is allowed to have like 200 high-quality passes whenever he steps into a job, and then it all goes to hell on pass No. 201. And afterward, the Bucs' starter was feeling himself in the locker room. And he took that look up to the podium to talk to reporters after the game. Staying humble, it appears, is synonymous with grabbing DeSean Jackson's bling for your postgame press conference. People were, um, not happy with the way the Eagles' defense played. The Eagles made the score a bit closer with a late touchdown catch by Nelson Agholor. But even more impressive than is grab was the acrobatic leap he took to spare the life of an unsuspecting cameraman on the sidelines. Worried about the loss? It's only Week 2. There's plenty of time. Plus, remember what happened last year? But if you need something to tide you over until next week's matchup against the Colts back at the Linc, have a laugh with these great replies on our Twitter feed. Even after a loss, Eagles fans can have a sense of humor.